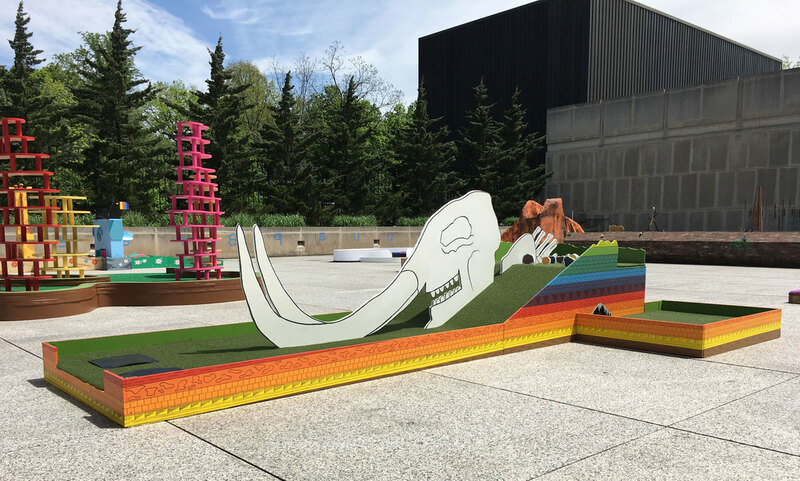 This mini golf hole derives its inspiration from the geologic record in Indiana, represented in the bedrock geology and the fossil record. The sides of the hole are derived from a Geologic Section Across Southern Indiana from East to West, published by Indiana University Geological Survey in 1898. This hand drawn survey depicts millennia in both bedrock geology and surficial topography. The semi-exposed mastodon skeleton is the largest creature in Indiana’s fossil record, dating to the last ice age, and creating an obstacle on the course. And successfully navigating the fossil bed leads to a limestone cave, and a hole-in-one.